Happy Thanksgiving :). I had the best dinner last night with even better company and I did not need to cook a thing. I don't remember the last time I was not the cooking the Thanksgiving feast. It is also Mojo Monday this is today's sketch. It was a beautiful sunny morning but the gloomy rain clouds are moving it, I did not catch the sun in time to get the extra light for the picture of the card so it is a grainy... again. I seem to be struggling with my card shots lately. I have glanced over this pretty designer paper (Graphic 45- Botanicabella Collection-Secret Garden) for months not knowing what to make with it, I think it almost looks Christmasy today was the day to make it work though. 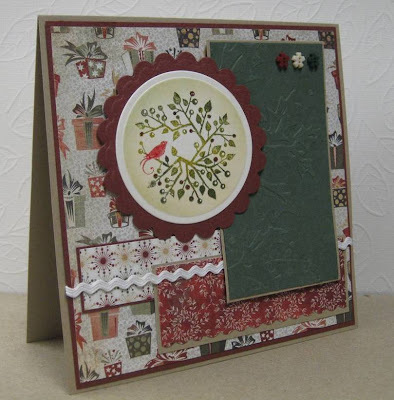 Supplies: Cream and sage green cardstock, Designer paper-Graphics 45-Botanicabella Collection, A Muse-Lily, Martha Stewart Edger Arch Lattice Punch, Sizzix-Buttons Die Cut, Trim it Up-craft ribbon, Ruby Slippers-Stickles. I am thankful for family and a wonderful life. Creepy Crawlies, creepy creepy crawlies crawlies, I love that song. Anyhow :) this Halloween card was easy to make once I decided what I was going to do. I love Memory Box stamps, and I looked at this one a 1/2 dozen times before deciding to buy it. 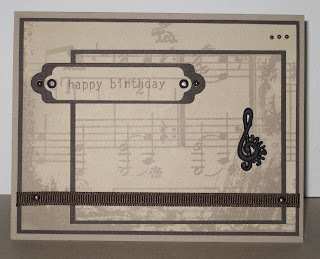 Bottom layer is the same DP as the top, second layer I used my Cuttlebug Spider Web embossing folder with black cardstock. I stamped the Halloween College on the Designer paper, then added black stickles to the spider bodies. I finished it with some gold and black embroidery thread and a single spider from Jolee's spider web set. Supplies: Cream and black cardstock, Designer Paper-Stampin' Up! Ghostly Greetings, Memory Box-Halloween collage,Cuttlebug spider web embossing folder, gold embroidery thread, Stickles-Black Diamond, Jolee's Spider. This is exciting :). Mojo Monday was a first for me and I really enjoyed it more then expected. I usually card what comes into my head and sometime that is challenge enough, I figured I would have a hard time following someone elses challenge. It worked I did it, which surprised me as I can't ever follow a recipe when cooking so I really did not think it would be any different with card making. I had a wonderful invite as a result, I am not silly enough to think I was singled out I am sure I am one among hundreds even thousand but hey, I am not going to complain. This is the comment. "Hope you don't mind me stopping by to tell you about Papercraft Star (just in case you don't already know!) We'd love to have you enter some of your inspired projects in our challenges there. We're also having a DT call soon and want to tell papercrafters like you about the call! There is still time to enter our PTI gift certificate drawing too! http://papercraftstar.blogspot.com/2010/09/another-gift-certificate-give-away-at.html"
So of course I became a follower of this site, and as you can see it is on my sidebar. I am looking forward to participating in some of the challenges, I think I may be hooked. Take a look and sign up to win. Two posts in one day, sheesh what's going on :). Mojo Monday is something new for me, a number of the blogs I follow always mention it but alas I have never tried until... I told my sister Barb that we should try it, thinking she would say one day or maybe when you visit next. Nope my sister made a card right then and there. 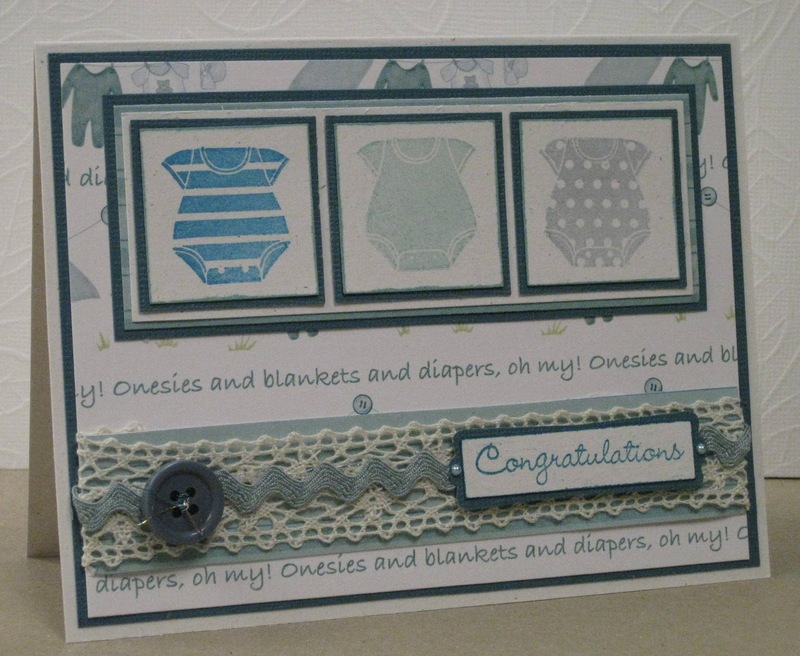 Check her blog :) Crazy sister, of course then I HAD to make a card. I had all my supplies out from yesterday's cardmaking so yes I have a repeat with the Designer paper but it is so pretty.. This is the sketch for today's Mojo Monday. This is my try at it. Sorry the image is a little dark, the is a little more cheerful in real life. 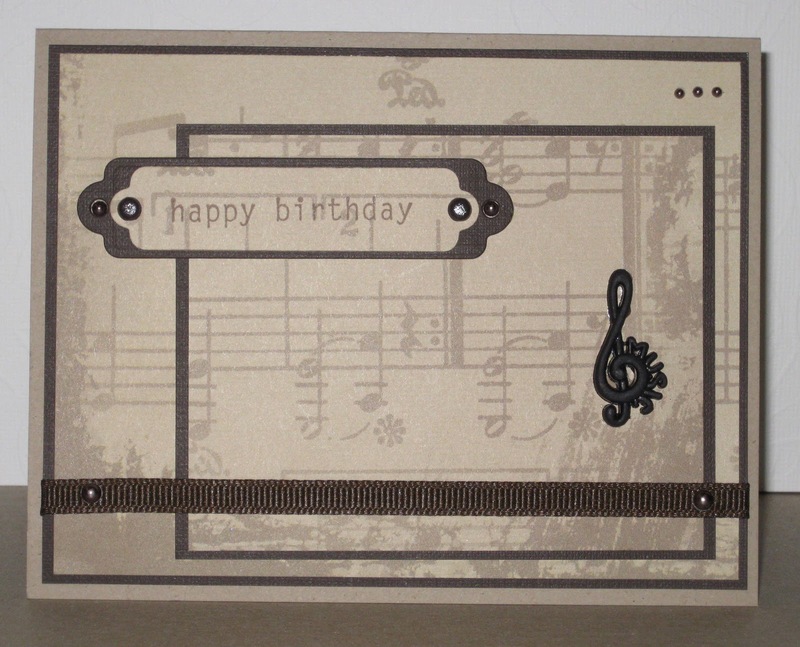 I used Spellbinders Impressabilities Flourish on the second brown layer, I used mesh ribbon which really likes to curl, there is a cute little bow in those curls somewhere. Supplies: Craft brown and dark brown cardstock, K&Company-Brown Florals Die Cut Paper, Sizzix-Flourishes die cut, Amuse-latte pretty pearls, brown mesh ribbon. 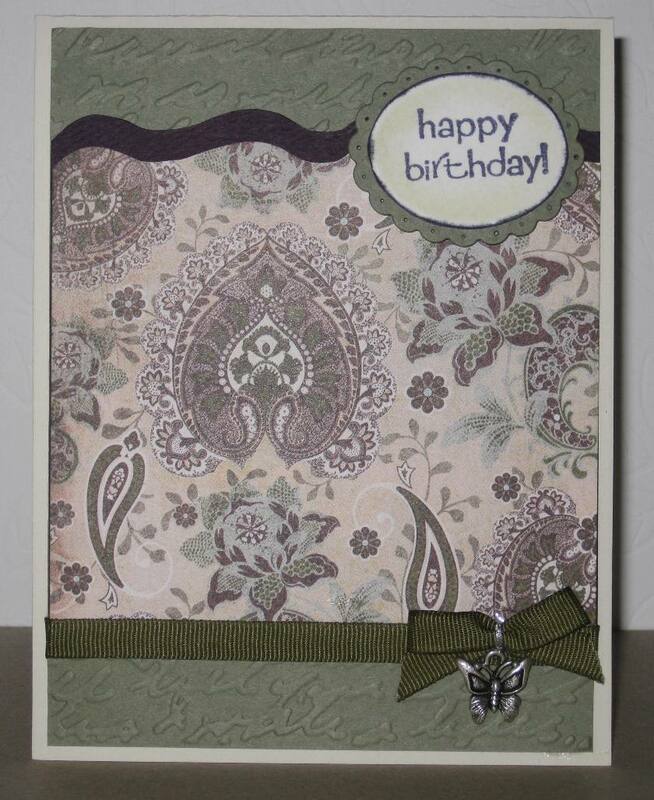 I did not get the chance to make any cards on Saturday, I did however go throught a good portion of my Designer Paper and organize a little. I found a couple of advertisments for requests for supplies from ladies who volunteer at non-profit places. So I delivered some on Saturday and am waiting for the other lady to pick them up. 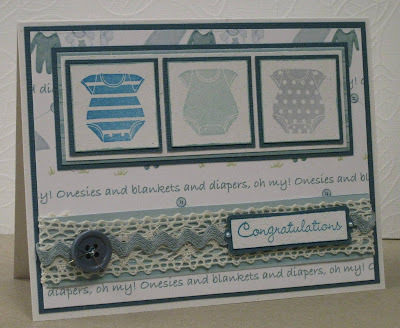 I may have not made any cards Saturday but yesterday I managed three. 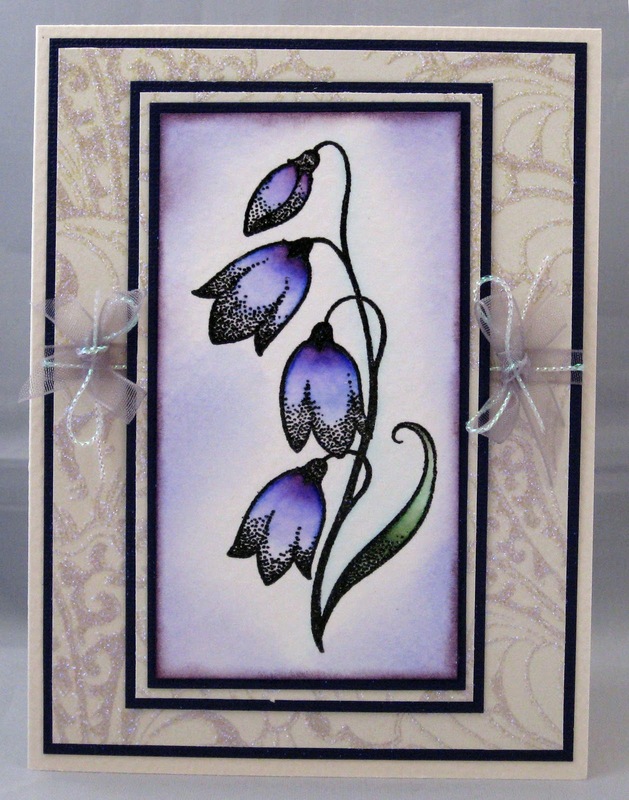 This is a sympathy card I made. 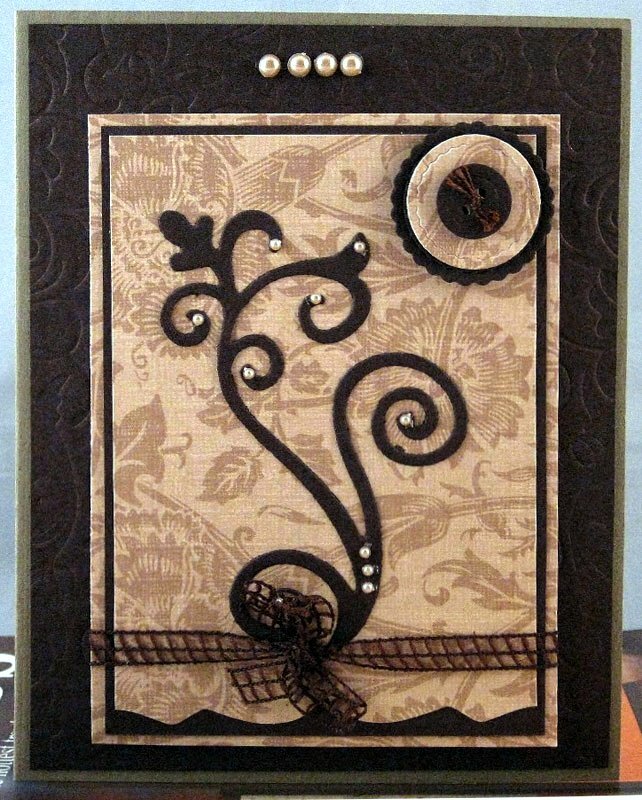 Supplies: Cream and brown cardstock, K&Company-Brown Florals Die Cut Paper, Memory Box-Budding Branch, Rivercity Rubber Store-With Sympathy, Brown organdy Swirl Ribbon, Kaiser Craft Pearl Strips. Isn't this paper cute, little Bo-Bunny Goblins and crew cupcakes. I am fortunately enough to have friends with children because I love making Halloween cards. I am sure when my adult friends recieve these once there children are grown they will with think I am crazy or they will be delighted. Either way I had fun making them. 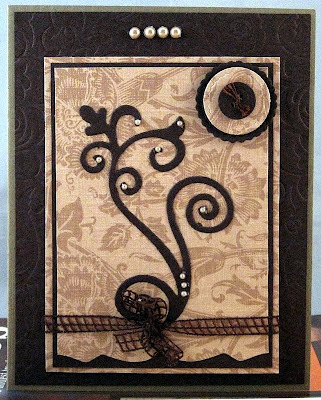 This one was quick and easy with a single layer of cardstock, I used a circle punch to cut out a creature then cut two sections of designer paper that worked well together, cover the seam with ribbon, added a brad and voila. Supplies: Cream and orange card stock, Designer Paper-bo Bunny Boo Crew Goblins, Stampin’ Up!-Ghostly greetings, Celebrate It-Happy Halloween Ribbon, black-doodlebug sugar brad.